The Miami CTSI is sponsoring up to four Mentored Translational Research Scholars Program Awards (KL2) for the fiscal year FY19. This program will support the research career development of early stage investigators at the assistant professor level for two years and will include: (1) 75% salary support up to the NIH Salary Cap; (2) $2,500 for travel and training-related activities; (3) $30,000 for research expenses. Modest funds to cover research costs and/or expenses associated with tuition, training opportunities, and travel support for preceptorship in expert labs or to attend relevant scientific meetings. All eligibility criteria must be met at the time of submission of the proposal (August 13, 2018). Additional important eligibility criteria apply. Please refer to the RFA. Be a full-time Assistant Professor (tenure or non-tenure-track) within 6 years of your first faculty appointment at the time of submission. Commit a minimum of 75% time to research and research training over the award period. Demonstrate a commitment to a career in clinical and/or translational research. 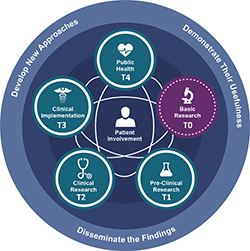 Proposed research must be translational (T1 – T4) in nature and scientifically meritorious. Within a week from the LOI submission, selected candidates will receive an invitation to submit their full application. For more details on the contents of the LOI and full application, please refer to the instructions document. Awarded projects that involve Human Subjects or live vertebrate animals must obtain NCATS approval before the research can start. The process requires that all the regulatory approvals be in place, and may take 30 days or more. For more information, visit the NCATS website. Questions regarding the KL2 Program should be emailed ahead of time to Gwendolyn B. Scott, M.D., Director, Miami CTSI KL2 Program, and/or Alessia Fornoni, M.D., Ph.D., Co-Director, with a copy to Patricia Avissar. Questions related to the on-line application process should be directed to Patricia Avissar, or at 305-243-5085 during office hours, and before the deadline.